FILE - Brazil's Economy Minister Paulo Guedes speaks during a ceremony where the country's government bank presidents are to be presented at Planalto presidential palace in Brasilia, Jan. 7, 2019. Brazil's pension reform process hit two speed bumps on Tuesday, as Economy Minister Paulo Guedes did not attend a first congressional hearing on the proposals and a bloc of 11 political parties demanded the removal of changes affecting retirement benefits for rural and disabled workers. Guedes's appearance at the 'CCJ' committee was seen as a highlight of pensions reform negotiations this week, amid growing concern the government is disengaged from the process. The government's chief congressional whip Joice Hasselmann played down Guedes's no-show and said the sections the 11 parties want removed from the bill would not undermine the fiscal savings target of 1 trillion reais ($258 billion). "The important thing is that they will still vote for the bill," she told reporters. These moves later reversed, but markets have been volatile lately on concern that political fragmentation in Brasilia will delay and dilute pension reform, the government's signature bill aimed at restoring public finances and kickstarting the economy. 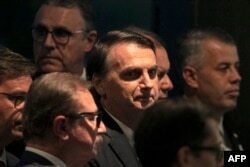 The process appears to have run into quicksand, with even the government's allies who want pension reform passed stepping up criticism of President Jair Bolsonaro for lacking leadership in selling the ambitious bill to lawmakers. FILE - Brazil's President Jair Bolsonaro arrives at the inauguration ceremony of the new president of the Parliamentary Front of Agriculture (FPA), at the Clube Naval, in Brasilia, Jan. 19, 2019. Leaders of 11 parties that support an overhaul of Brazil's costly pension system announced that they would push to remove changes to rural retirement and so-called BPC payments to the elderly and disabled from the draft bill. The bill, the cornerstone of Bolsonaro's economic agenda, aims to shore up Brazil's shoddy public finances and reignite an economic recovery, but the defiance of so many parties underscores a rocky reception in Congress. Center-left opponents of the pensions plan, who want major changes to the bill, criticized Guedes's absence from Tuesday's hearing, saying it deprived Congress of the chance to debate the reform bill and propose alternatives. "His absence is very bad. Fleeing from debate is never a good solution," said opposition leader Alessandro Molon of the Brazilian Socialist Party. Minutes released on Tuesday from the central bank's last policy meeting said pension reform was critical to supporting growth, controlling inflation and keeping borrowing costs low.